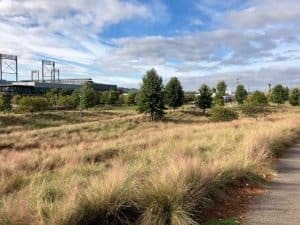 Have you ever strolled through Railroad Park in October? If so, odds are you’ve seen a sea of pink inflorescence, otherwise known as Pink Muhly grass, waving in the wind. This light, fairy-like grass boasts vibrant pink blooms in the fall and has quickly become a trending plant throughout the southeast. 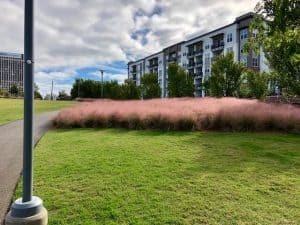 Native to the eastern half of the country, and especially Florida, Pink Muhly grass belongs to the Muhlenbergia genus named after American scientist and botanist Gotthilf Henry Muhlenberg (1753-1815). Over 150 species fall under the Muhlenbergia genus, but only a few are commercially available. Pink Muhly grass (Muhlenbergia capillaris) rivals other ornamental grasses for its high tolerance of sun and heat. In fact, once the plant matures, supplemental water is only necessary during periods of severe drought. Plant this grass at least two feet apart, in full sun and with well-draining soil for guaranteed growth. While this perennial classifies as a semi-evergreen, you may want to consider cutting it back in early spring to remove brown blades and prepare for new growth. Afterwards, only a few months remain until it begins blooming in September. The three to four foot blades will brighten the fall season with their pink hue until November. For ideas on how to incorporate Pink Muhly grass in your landscape, visit Gardenista.